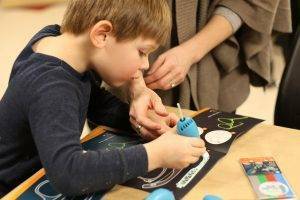 Home » After School » STEAM Night at USES! For the second event of the Family Engagement Series, USES hosted a STEAM Night on Friday, March 15th from 5-7pm. The event allowed parents to gain a better understanding of our unique science, technology, engineering, and math curriculum that promotes learning through art and creative expression. 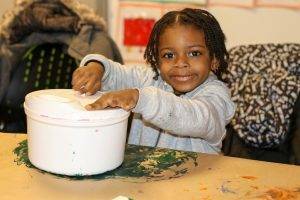 In addition to showcasing the art of kids in our Early Childhood Education program, we offered three interactive stations including bubble painting, 3D doodle pens, and salad spinner art. The descriptions, instructions, and materials for each activity were listed on an informational handout so that parents and kids could replicate their creations at home! Most families arrived around 5:30 after picking up their kids, and jumped right into the activities after grabbing some snacks outside the large multipurpose room. 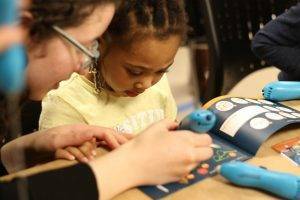 The majority of attendees were ECE families, so parents/caregivers and their kids worked on each project together with the help of a designated USES staff member. Additionally, older club48 participants who attended enjoyed the 3D doodle pens, which required a little more patience and skill then the other two paint-based projects. The salad spinner art was also incredibly popular, and most families ended up making and taking home several colorful squares! 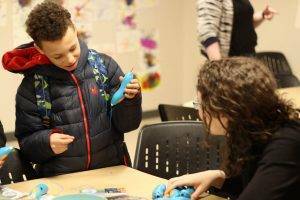 Not only did parents get to see their kids think creatively and express themselves through art, they were also able to mingle with other USES parents and neighbors in a casual and welcoming environment. One parent noted in our post-event survey that “it was nice to feel like we were part of a community and the kids of all ages could enjoy and feel proud. It was also a safe space to talk with other families.” Thanks to everyone who joined us!